It may not be the first thing that most people think of when they think about investing in precious metals, but because of scarcity and the wide variety of industrial uses, platinum investing is becoming more popular every day. Platinum comes in both grams and ounces, making it even easier for investors to get started building wealth in platinum. The difference between our 1 gram platinum bars and 1 ounce platinum bars represents just how easy it is for a first-time investor to find a foothold in platinum investing, while still offering a significant investment opportunity for those who want to consider larger purchases. 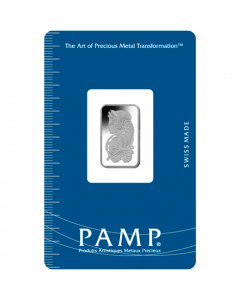 While there are hundreds of private mints that create platinum bars, most of the market is concerned with Pamp Suisse platinum bars, which is what we carry here at SD Bullion. These high-quality platinum bullion bars carry a certificate of authenticity, as well as the reputation of a mint that has become the go-to for high-quality platinum bars. In our case, each Pamp Suisse platinum bar, whether it is a 1 gram platinum bar or 1 ounce platinum bar, comes encased in a Certicard that contains all the information to validate its authenticity. The 1 oz platinum bullion bars are particularly lovely, featuring a classic beauty in profile, with a cornucopia of bounty spilling out before her; on the obverse is the bar’s identifying information, including the words “Suisse, 1 ounce platinum, 999.5”, as well as the bar’s certification number. The 1 gram platinum bars features the same design in smaller detail. We also carry a Pamp Suiise 25 x 1 gram Multigram set, which features 25 of the 1 gram platinum bars set into a collectible grouping of Certicards. This would be a great way to invest in gifts for the whole family at once, or to build a platinum portfolio element very quickly. Each 1 ounce platinum bar is the same as roughly 31 of the 1 gram platinum bars. At the 1 ounce level, the bulk discounts make it far more viable to invest in bulk platinum. In addition to selling Pamp Suisse platinum bars, we also buy platinum bullion bars and platinum coins, for a premium rate. Call our trade desk at 1-800-294-8732 for more information, or get in touch with us right here on our website. We’re happy to help you find the best way to liquidate your platinum investment when the time comes.